An interesting story has emerged linking a badly burnt survivor from the SS Athenia, a Galway pharmacy, and Glasgow’s Riverside Museum. I have written recently about the SS Athenia, torpedoed off the Rockall Bank on September 3 1939, the first day of the war. The ship, which had set out from Glasgow was on its way to Montreal, Canada, with more than 1,100 passengers and crew on board. One hundred and twenty eight people were killed. The remaining passengers and crew, however, were picked up by passing ships. The Norwegian Knute Nelson, headed to Galway with 430 survivors. Many of whom were injured and burnt. The Knute Nelson was met off Blackhead by the Galway tender Cathair Na Gaillimhe, with doctors and nurses on board, which brought the survivors back to the town. In an exemplary display of hospitality and care; and despite its modest facilities, Galway rose to the occasion magnificently. Among the injured were three men severely burned. Two were treated at the Central Hospital. However Sidney Worrall from Glasgow, who worked as a cook on board, was extensively scalded by boiling oil which spilt on him on the impact of the torpedo. Somehow Worrall managed to get into a lifeboat where he was cared for, as best as possible in the circumstances, by a Canadian passenger Gerry Hutchinson. Fearing he was going to die, Worrall took off his watch, and gave it to Hutchinson, asking him to keep it for him. We know that some weeks later the survivors returned to Glasgow where the American ambassador’s son, John F Kennedy, organised another ship, which would sail under an Ameican flag, to bring them to their original destination. As they sailed Gerry Hutchinson heard nothing of Sidney Worrall, the man he had helped, and whose watch he held, and treasured. He returned home. He became a minister of the United Church of Canada. He died in 2015. His son Rob Hutchinson, gathered his father’s mementos of his Athenia adventure, including Sid Worrall’s watch, and thinking they might be of interest to Glaswegians (where the Athemia originally set out from ), sent them to Glasgow’s Riverside Museum. Its curator, Emily Malcolm, immediately began to research what had happened to Sidney. She was delighted to find that Sidney had survived his terrible burns, had lived a long and eventful life (in fact he returned to the merchant navy before the war’s end ); he married, and had a daughter. He died in 1973. Both his granddaughter Cath Muir, and his nephew Dr Ernie Worrall with other family members, came forward to view Sidney’s watch. So what happened to Sidney Worrall in Galway? Sidney was taken to St Bride’s Nursing Home, on Sea Road, where his extensive burns received exceptional care. This was at a time when little was known about the treatment for severe burns, or of skin grafting. Sadly the world was soon to learn how to cope with deep third degree burns, typically suffered by wounded aircraft pilots; but doctors Robbie Sandys and Sean O Beirn knew enough to cover Worrall in a cod liver oil and zink cream. The cream was made up every morning by sisters Silé and Eibhlin O Beirn, at O Beirn’s pharmacy, Henry Street. The poor man made a remarkable recovery, and was probably the last of the Athenia survivors to leave Galway. When he returned to Glasgow all the excitement had passed. The other survivors had long sailed. Sidney was proud of his scars and skin grafts. He showed them to anyone interested saying they were the maps of the world sown on to his body. Sidney’s family did not know that his watch was in the safe keeping of the Huchinsons in Canada. Sidney never mentioned it; but now everyone is delighted. An exhibition of all the known artifacts of the Athenia is being prepared in the Riverside Museum for later this year. Sidney Worrall’s story and his watch will be the main feature. NOTES: *I am very grateful to Brigid Brophy for telling me all this. Brigid’s grandfather was the famous Seamas O Beirne (1881 - 1935 ), from Twin Island in Galway Bay. He was a passionate Irish language promotor, and a brilliant doctor. After he was appointed dispensary doctor at Clonbur, he conducted an imaginative battle against TB, even burning down houses where TB was passed on through generations. He was a playwright, and one of the founders of An Taibhdhearc. He married Sabina O’Malley of Kilmilkin (the O’Malleys again! ), and had ten children, three of the boys becoming doctors. He was a friend of Marconi, de Valera, and Roger Casement. 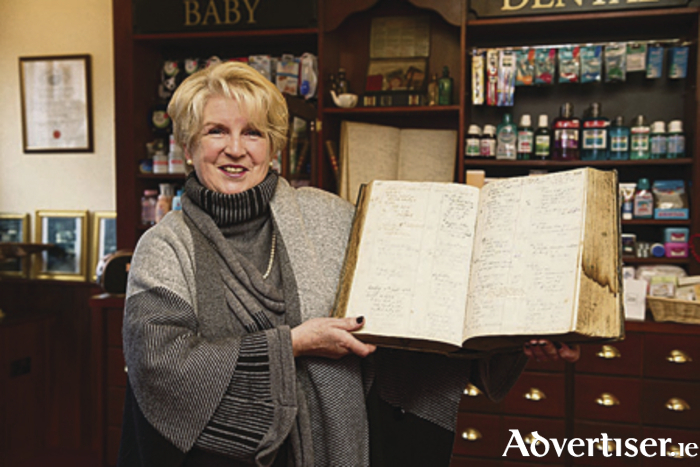 He founded O Beirn’s pharmacy, which his daughters Silé and Eibhlin ran. I have written about him many times, as he keeps cropping up in the Galway story.